Star Trek the Next Generation Season One Blu-ray Review. If you're a fan of Star Trek, than I could happily recommend this Blu-ray release to all trekkers and true sci-fi buffs. Even if you missed Star Trek the original airing or were too young but you're a fan of sci-fi, than this release will definitely create thousands of new fans. 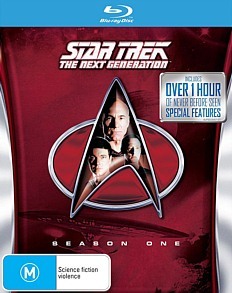 It's a good time to be a Star Trek fan, especially with the Australian release of Star Trek the Next Generation (ST TNG) Season One on glorious Blu-ray. After the HD-DVD fiasco with Star Trek several years ago, fans can of STNG can now finally add this definitive Star Trek series to their collection and by Starfleet does it look good... we also believed that Blu-ray was the only high definition format. Just like the sampler disc which was released, the video and audio quality almost make STNG seem like something that was filmed today. If you have never seen the sampler disc before, Paramount have added a very cool advertisement to start of this Blu-ray disc which really gets your Trekker adrenaline pumping. It basically highlights some of the changes made to the Blu-ray which shows a side by side comparison of the original TV series compared to the remastered Blu-ray version. The difference is like night and day. Even though this release does not offer widescreen (16:9) as the original series was filmed in an aspect ratio of 1.33:1 which is how the series first aired, video quality however is the key to this remastered release. 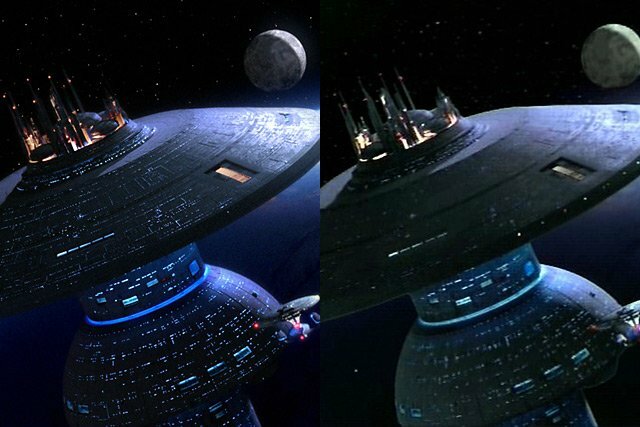 Whether you're looking at the pores on Captain Picard's (Patrick Stewart) face, the texture detail on Counsellor Troi's (Marina Sirtis) uniform or seeing the saucer section of the Enterprise detach from the main hull, it's almost like you are watching the series for the first time again due to the extreme clarity. The only downside to the video quality is that there is some grain which unfortunately on Blu-ray stands out even more. Fortunately this is a moot point. However to compliment the video, you have the amazing sound quality of DTS-HD 7.1 which creates this amazing Star Trek experience. However all this quality does highlight some of the budgetary limitations of filming this new series of Star Trek. As everything is so clear and sharp, sets look a little cheaper than I originally imagined, including some of the uniforms. However for true trekkers, this should not pose any issues but just be warned, you do get up close and personal. Although I'm sure most Trekkers would like to get up close and personal with either Security Officer Tasha Yar (Denise Crosby) or Counsellor Troi, unless of course Worf, our favourite Klingon (Michael Dorn) is more your style. All kidding aside, Paramount should be commended on such an amazing release that will definitely help this series stand the test of time, even longer now. Unlike George Lucas' totally revamp of Star Wars, The Empire Strikes Back and Return of the Jedi, the people responsible for remastering this series have not added new people or special effects into the original story. Rather, by touching up the video quality and special effects, it just highlights the vision of Gene Roddenberry even more. For the uninitiated Star Trek the Next Generation was a modern sequel to the original Star Trek series helmed by William Shatner as Captain Kirk and Leonard Nimoy as Spock. Roddenberry's vision of Star Trek was where humanity had progressed over their bitter wars, racism and social issues. However as they explored the galaxy, they did encounter similar themes which at times was a social commentary on the 20th century. The original series was released in 1966 and ran until 1969 before it spawned a handful of movies. Then in 1994, Star Trek the Next Generation was released which proved so popular, it produced 7 seasons, a spin-off series and movies. Leading the crew of the New Starship Enterprise is Captain Jean-Luc Picard (Sir Patrick Stewart) and Commander William T. Riker (Jonathan Frakes) who both proved much more serious than the original captain. Their crew was made up Counsellor Deanne Troi (Marina Sirtis), an telepathic empath, Lt. Commander Data (Brent Spiner), an android who is trying to become human and Lieutenant Worf (Michael Dorn), a Klingon who now calls the united federation home. It was a varied cast that proved a successful formula for trekkers and sci-fi buffs around the world. This remastered edition of season one of Star Trek the Next Generation contains the pilot Encounter at Farpoint which introduced one of their most annoying nemesis, Q, a godlike prankster. Looking back at this episode, it's still written extremely well and doesn't date poorly. Other episodes include The Naked Now, Code of Honor, The Last Outpost, Where no One Has Gone Before, Lonely Among Us, Justice, The Battle, Hide and Q, Haven, The Big Goodbye, Datalore, Angel One, 11001001, Too Short a Season, When the Bough Breaks, Home Soil, Coming of Age, Heart of Glory, The Arsenal of Freedom, Symbiosis, Skin of Evil, We'll Always Have Paris, Conspiracy and The Neutral Zone. You're definitely getting value for money here. This collection also features a plethora of special features that include over 95 minutes of new documentaries and cast/crew interviews plus some fun episodic promos. The documentaries incorporate the essence of Star Trek into them that include the origin of this series, the remastering of the series plus some great promos, archival footage and gag reels. Even the menu is oozing with a ST NG atmosphere that shows that Paramount has cut no corners in this release. If you're a fan of Star Trek, than I could happily recommend this Blu-ray release to all trekkers and true sci-fi buffs. Even if you missed Star Trek the original airing or were too young but you're a fan of sci-fi, than this release will definitely create thousands of new fans. Its been painstakingly remastered and whether it's improved video quality or the background ambience of the sound effects such as the computer sounds on the bridge that sounds amazing thanks to the DTS-HD MA 7.1 soundtrack, Star Trek the Next Generation has never been this good. This is how a sci-fi series should look and sound but best of all, the stories are just as entertaining as they originally were in 1994.